Great staple tor is a unique and stunning Dartmoor granite tor, situated about 2 miles of the road main close to the small hamlet of Merrivale at grid reference SX742805. It really is a must visit for photography due to its unique stacked steeple shape being one of Dartmoor's most recognisable tors. For those who like a Dartmoor brewery ale or two this tor is used on the label of its beers such as Jail ale. 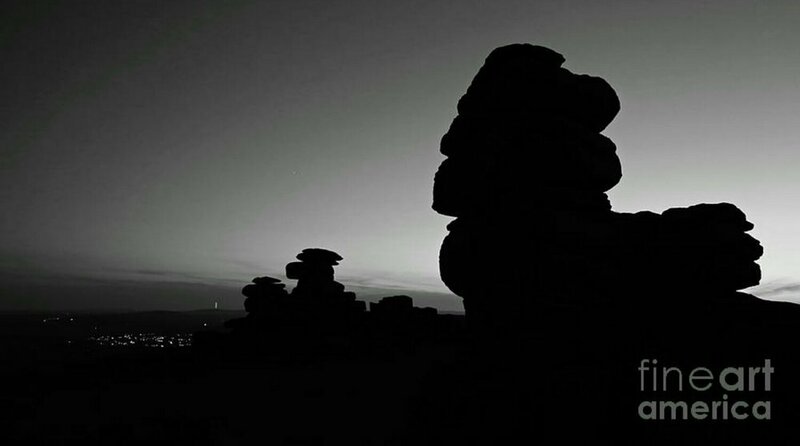 Great staple tor as well as its surrounding tors Roos tor and middle staple tor are stunning places to visit for a sunset or sunrise since you have amazing views across the open moorland, towards Plymouth, Princetown and Tavistock. you can also get some good silhouettes of the tors during late sunsets or early sunrises, there are many possibilities with this one and thousands of compositions. Good for: Unique granite tor shape, panoramic views across Dartmoor, great location for sunsets or sunrises, you can also get some nice astrophotography shots at this location although you will want to visit in the winter when the Milkyway is a lot lower in the sky, the light pollution from Tavistock and Plymouth is impossible to miss unfortunately and beware of the BBC radio mast at North tor Hessay at night. Clearer skies can be had by facing towards Roos tor. Difficulty: 20 min walk of the track / car park location with easy difficulty to find the location by car but you will enjoy lovely views on the way across the open moorland of Dartmoor. Approx 45 min one way trip from Ashburton by car. 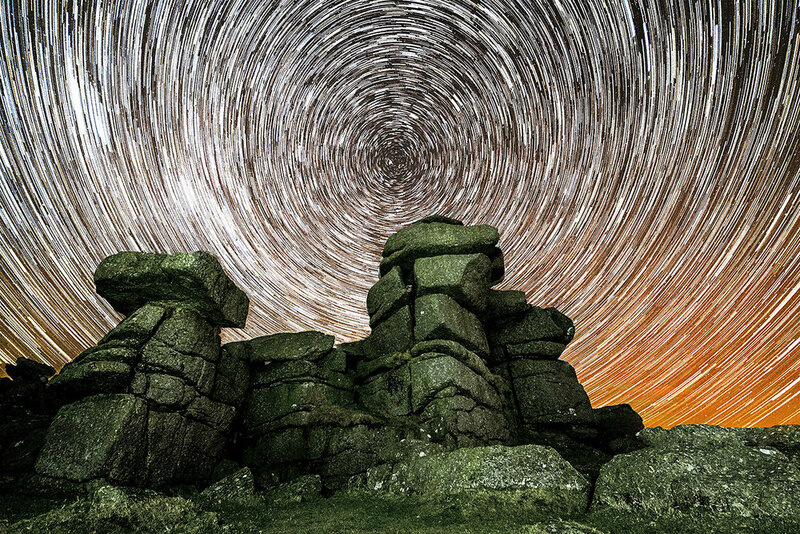 15 min from Tavistock, quite a remote location once your at the tor and it can be a bit daunting sitting on the tor at night waiting for astrophotography unless you are used to the remoteness. A torch is a must. Location: Great staple tor is accessed via a small car park at Cox tor at grid reference SX 53137 75150 between Merrivale and the car park that looks over Plymouth (the one with the plaque).. If your coming from Ashburton or Princetown direction head past Merrivale climb the hill and keep looking on your right after a short while you will see a medium sized but very well hidden car park, park here and climb over the bank you should see clitter which is like granite rubble left over from the granite works that used to be done in the area you can still make out the faced granite benches that were used to work other pieces of granite on to make different shapes. Walk from the clitter field straight up and slightly towards Merrivale direction (to your right) you should then see middle steeple tor followed by Great steeple tor in the distance. if you are in the next carpark higher up simply head in a greater direction towards Merrivale. If coming from Tavistock direction once you get to the top of the hill by the back end of Peter tavy you should see the car park with the plaque on your right follow the road for a very short while and the car park will be on your left.